As the dust settles around all of last week's major E3 announcement, some news has begun surfacing that serves simply to clear up rumors, confusion and misconceptions. One of the major ones that absolutely has to be hit upon before it gets swept along in the current of gaming news is the current design limitation of the Wii U's hardware. "Our basic premise is that you can use one with a system…If we got to an idea of having multiple, it might be just more convenient for people to use their Nintendo 3DS and have a way to connect that. That being said, we are doing research about if someone brings their controller to their friend's house and they want to play together on Wii U to whether or not something like that would be possible." Miyamoto did not elaborate on the possible technical barriers that may stand in the way of offering multiple Wii U controllers per console. The wireless video streaming may limit the system to one Wii U controller at once. Or Nintendo may be set to lose money on the production of the controllers themselves and, thus, wants to limit their purchase. As an E3 convention goer, I got a chance to see some of the potential play modes for multiple users on the same console. It's early in the Wii U's development cycle for sure, so the design principles seemed a bit similar across the board. Most developers employed a design that involved the Wii U controller holder taking on a bird's eye perspective of a map while other players handled first or third person perspectives. 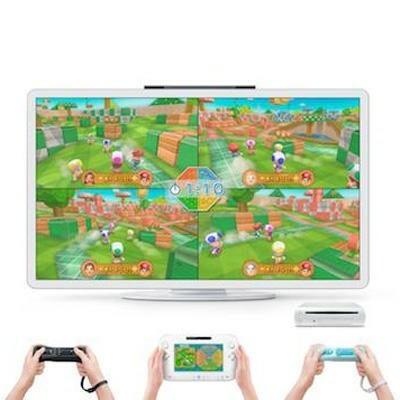 The Wii U controller user then interacted with the map in order to play a game with the users restricted to the TV screen and Wii Remotes. The most interesting usage of this design principle came from Ubisoft's newly announced Wii U shooter Killer Freaks from Outer Space. The traditional controller user played an FPS style game on the TV while the Wii U controller user flew above his opponent and set alien spawn-points, traps and weapons. The result was definitely interesting. With news of the current hardware limitations, does the Wii U seem more or less attractive to you as a gamer?